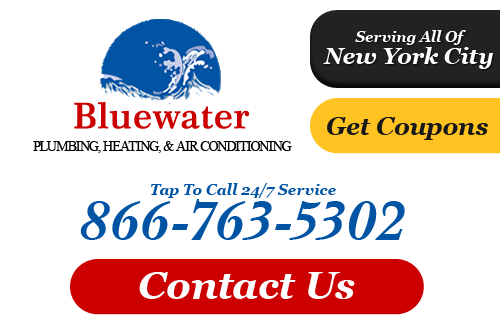 Read reviews and testimonials from clients who have hired Bluewater Plumbing, Heating, and Air Conditioning for plumbing, heating and air conditioning servicesin the Queens area. "Roger was very responsive (always calling me back and follow-up several times to make sure the job was done right). One of the best experiences I've had on Service magic and I would definitely use Roger again." "They are professional, knew what they were doing, and got it done." " So far the job is about 50% complete. The work thus far has been very clean, laid out nicely, very neat and high quality plumbing work. I'm very satisfied with the price and the cooperation I'm getting. 6/08 Job was completed to my stisfaction. Highly recomend this contractor"
"Absolutely Excellent Service. Professional and Honest. I called around for estimates and was given the best price by Bluewater. All I had was a minor sink stoppage, but the work was completed quickly. They also assisted me in recommendations for other homeimprovement services I needed in the area and the recommendations were just as professional and honest as Bluewater. I would recommend Bluewater to anyone requesting plumbing services. Friendly and Professionalism alone sets them apart from the competition." "It was a pleasure to work with Roger and Steve. Roger did an excellent job of solving our problem in a way that was efficient, cost effective, and caused minimal disruption. I appreciate that he planned the work in such a way as to correct some other existing problems as well. I will call you again and recommend you to friends. Thanks"
"I could not have asked for better. He gave me a quote on the phone once I explained the job. He came prepared to do the job and he did it. He kept to his quote. I was 100% comfortable dealing with him. In fact, I was able to work while my 4.5 year old supervised him along with about 5 stuffed toys who apparently were plumbing experts. He is what you 'hope' a tradesman will be but rarely are these days." "You get what you pay for! After another so called "plumber" made a bad situation worse, I decided to be more cautious with the next choice. Roger was a up front with all my options and at the end of the day, having the peace of mind was well worth the few extra dollars." "I'm definitely a satisfied customer! George from Blue Water came and repaired my broken water main in no time. I finally know a reliable plumber that I can trust. I'll make sure to recommend you guys to my friends. Nice job guys"
"Roger was great. He took the time to explain our options without trying to oversell us. We now have reliable heat for the winter and a plumber we trust. Thank you." "I'm glad I checked this website and found this company. He took care of the problem fast and did not take advantage of us even though we were in an emergency situation. Thank you!" "My boiler was always going on the fritz. So when water was shooting out of a pipe, we called Bluewater. They repaired the leak and serviced the boiler and its never worked better. We get more hot water than we ever did. Thank God." "We had a violation in our new home and we were going to have to pay a fine. Roger came to us, removed our violation and provided us with paper work. At our hearing, all of our fines were waved. Thankyou for everything Roger!" "These Guys were great! I called on a Sunday and they were here fast. Price was very reasonable." For more testimonials and reviews of Queens plumber and HVAC company, Bluewater Plumbing, Heating, and Air Conditioning, please call 866-763-5302 or complete our online request form.